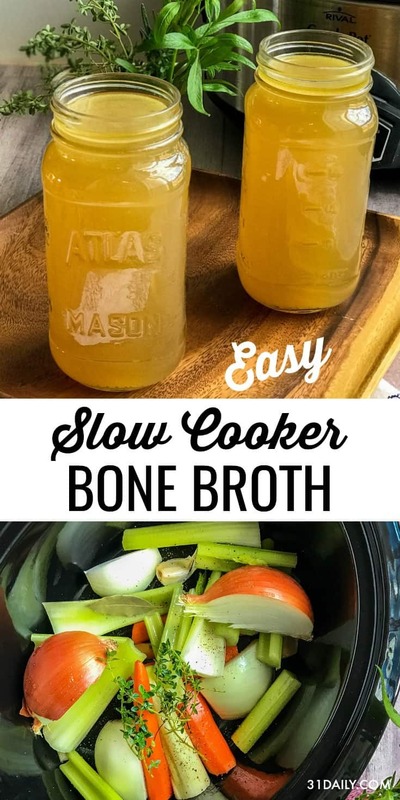 Making a Slow Cooker Chicken Bone Broth or Stock is more than a delicious and savory component to a meal. 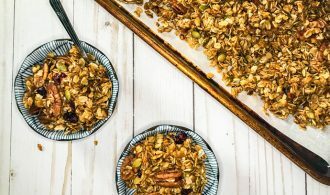 It’s an incredibly healthy ingredient to always have on hand. 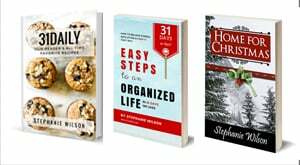 And it doesn’t get easier than with a slow cooker. 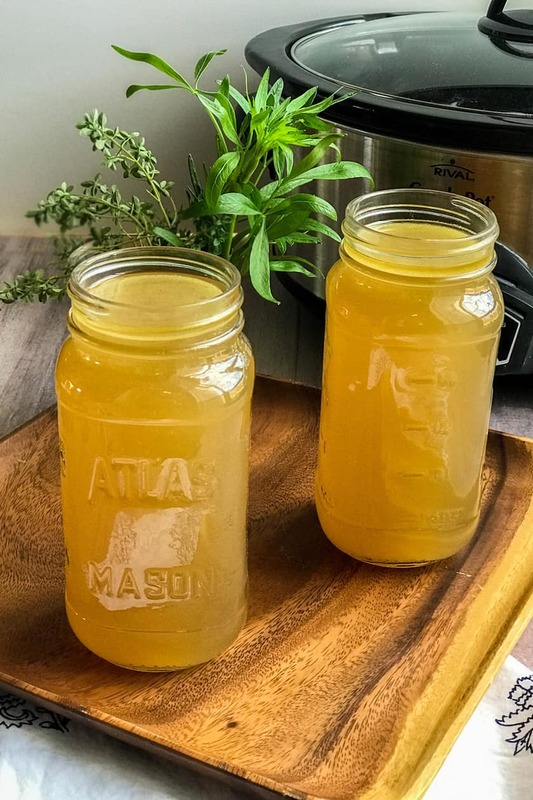 How Long can Homemade Broth Be Stored in the Refrigerator? For longer shelf life, homemade broth can be frozen for 1 to 2 months. 1. Cool. Refrigerators and freezers cannot cool soups quickly enough to be food safe. Speed up the cooling process by placing the pot of soup in a bath of ice water in the sink. Stir soup often to help release the heat. 2. Package. Label and date gallon- or quart-size zip-top plastic freezer bags, place in a bowl, and cuff the bag over the edge. Ladle soup into each bag, then let out any excess air and seal. 3. Freeze. Lay bags flat in a single layer in the freezer; when frozen, stack bags to save space. What I love about using my slow cooker for making chicken stock is that it’s completely self-contained. It frees up my stove for other uses. 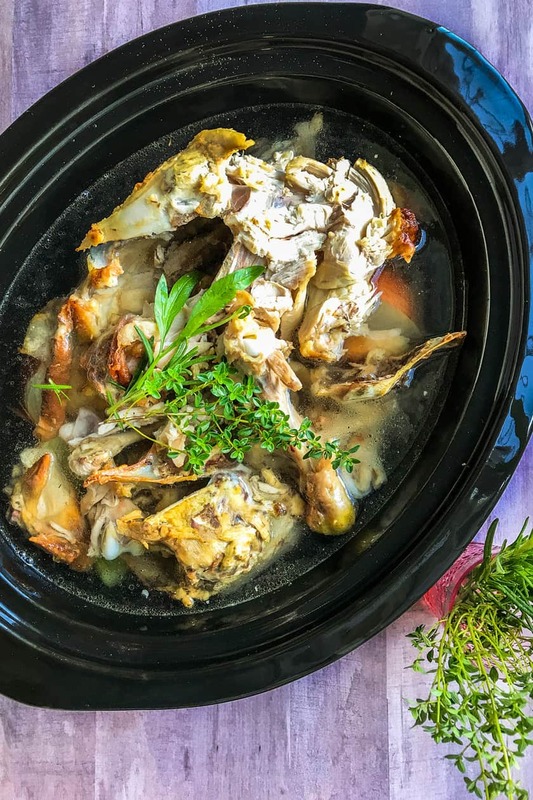 And… while the slow cooker makes its magic on the kitchen counter, it’s bathing my home with the most delicious aroma… ever. That’s comfort food at its best. Preheat your oven to 400°F. 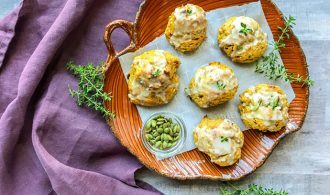 Place chicken bones on a baking sheet and roast for 20 minutes (if frozen or uncooked). Meanwhile, chop the carrots, celery, and onions and place them in the bottom of the slow cooker. Add the garlic cloves, bay leaf, and fresh herbs. Season with salt and pepper to taste. 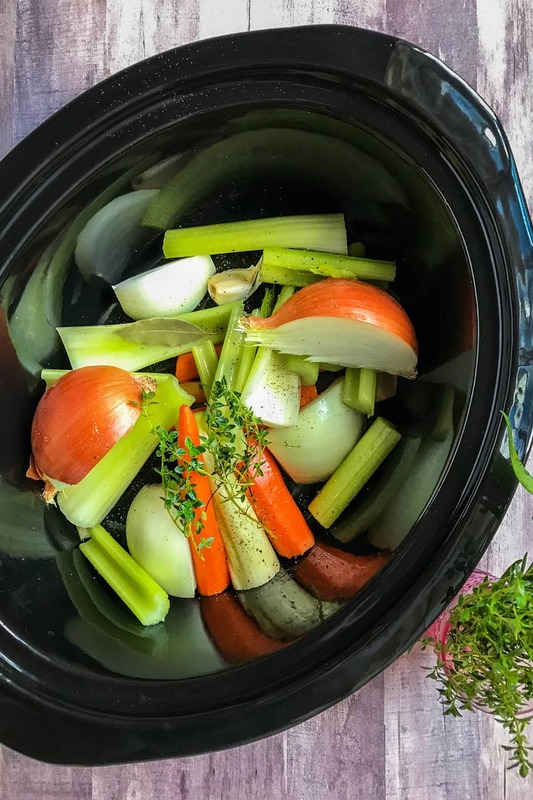 Lay the bones over the vegetables in the slow cooker; add water to cover, about 10 to 12 cups in a 6-quart slow cooker, or until the water is filled to within an inch of the top. Set the slow cooker on low, cover and cook for 6 to 8 hours, or until the broth has reached a beautiful golden color. Remove the larger pieces of bones and vegetables with a slotted spoon; discard. Then strain the broth in the slow cooker with a fine meshed sieve or strainer lined with cheesecloth. 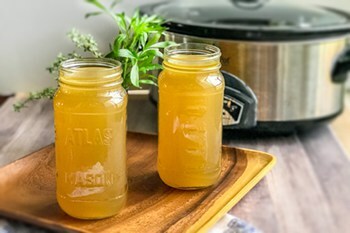 Transfer the bone broth into jars and refrigerate immediately. As the broth cools, any fat will float to the surface and can be removed before use.